IT IS a grim way to die. Packed into ill-equipped and poorly skippered craft, migrants who attempt to cross the Mediterranean from north Africa risk their lives even in the best of conditions. Wooden boats knocked together to hold some 75 people are often crammed with three or four times that number. Migrants report fellow travellers who have been crushed to death or exhausted, dehydrated and seasick, knocked over board and left to drown. When passengers panic or when fights break out the risk of capsize is acute. When conditions worsen, the risk of death rises sharply. A broken engine, a bewildered navigator or bad weather can hasten the loss of a boat. This week sandstorms struck as several hundred people set forth from Libya on perhaps four boats, apparently attempting to reach the coast of Italy. Libyan officials said on Tuesday March 31st that, having searched for more than two days, they had fished at least 21 corpses from the sea and had found one boat with a broken engine and 350 people aboard. 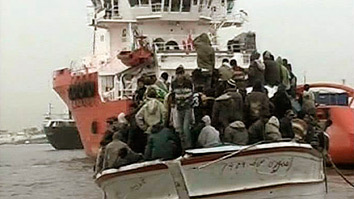 Hundreds of others, including women and children, are thought to have drowned. A spokesman for the International Organisation for Migration suggested that “more than 300 people have disappeared at sea” in this accident alone. It is unclear precisely how many people die each year trying to cross to Europe from Africa. In February at least 21 migrants from north Africa drowned as their boat capsized near the Canary Islands. In May last year 47 migrants died of starvation and exposure after their boat broke down en route from Libya to Italy. Many deaths go unrecorded. In some cases entire boats are lost. Only where survivors offer testimony are death tolls known in detail. Among those who attempt to sail from west Africa to the Canary Islands, some are washed into the Atlantic. In one case a boatload of corpses turned up in the Caribbean, apparently a cargo of Africans drifting far off course. A researcher with the Peace Research Institute, Oslo, estimated in 2007 there were 10-20 deaths per thousand migrants who attempted to cross from Africa to Spanish territory. At least 45,000 migrants reached Spanish and Italian territory alone in 2008. Total movement by migrants across the Mediterranean, including those who travel to Greece, Malta and elsewhere, is significantly higher. Migrants appear to be dying in much greater numbers than they did a decade ago, for a variety of reasons. The amount of migrants attempting to cross from Africa to Europe may be rising. In addition safer and easier routes of old have been closed, such as from Morocco to the Canary Islands, or across the Strait of Gibraltar to Spain. More effective patrols in some areas by Frontex, the European border agency, are forcing migrants to attempt more arduous routes. Some are reportedly setting off for Europe in craft from as far south as Gambia in west Africa. In the Mediterranean new routes have been opening, for example from Egypt to Turkey and from Turkey to Greek islands. As European governments strike deals with their counterparts in north Africa, more efforts to crack down on migrants are expected. In some cases, in exchange for aid and other assistance, Frontex conducts joint patrols with African navies. In other cases repatriation is made easier, in an effort to deter migrants from attempting their journey. European governments also encourage the likes of Morocco and Libya to deter the arrival of African migrants in their countries in the first place. But as crossing the border becomes more difficult and expensive, would-be migrants increasingly rely on the expertise of people-traffickers. Migrants report paying hundreds—sometimes thousands—of dollars for passage across the Mediterranean, with the traffickers keen to cram as many fee-payers on to a single boat as possible, in order to maximise profits. As the boats and equipment are abandoned on arrival in Europe, the craft are often cheaply built and carry woefully inadequate supplies. Those who command the craft are would-be migrants themselves, often former fisherman with a limited knowledge of navigation. Few on board even know how to swim. Frontex has had some success in shifting migrants from certain routes across the Mediterranean, but it is unclear how many, if any, are deterred entirely from attempting the crossing. Efforts to educate would-be migrants about the dangers of taking to small boats, for example with a poster campaign in Senegal, have had little impact. Migration researchers report that travellers, typically young men, are either fatalistic (believing that God decides their fate) or are so strongly motivated to find a better life in Europe that the risk to their lives is brushed aside. The sky was red tonight. Dramatically so. I know that because I could see it. The clouds have gone away. Spring has arrived, they exclaim. The whole country has lifted out of some communism-era stereotype of pervasive greyness. I don’t know where the somber clouds have gone but I need to know. I don’t want to see them again. Soon maybe I won’t expect to. But it’s too early for such recklessness. My upcoming weekend is adding to the joyful revival. Tom Lavin, an old mate from Uni and fellow Japanite is heading to Krakow where I will meet him. Joe is coming in from Dublin to join the fro. This will be the seventh country Joe and I have met in (Argentina, Brazil, Netherlands, Ireland, Spain, England and Poland in chronological order). That’s quite impressive. Tom and I have also been to countries together (Japan, Korea, Thailand, Laos, Cambodia, Spain and Poland). I could add England but it seems stingy. The weekend should be a fair one. Plenty of beers and vodka, talk and wandering around. I miss certain people to talk to here. The people who know me. Those opinions or brains I can fruitfully pick. And those conversations and laughs always go very smoothly with Tom and Joe around. >My mate James just became a father for the first time. Welcome Chloe Langley! I went to a handball game yesterday with a teacher called Piotr. They love it here. Orlen sponsors the national champions and they are in the semis right now. Pretty good atmosphere, full of chanting, flag waving, drums and fiery emotion. It’s a mix of basketball and football. Football goals, smaller ball. Basketball passing and tricking. Have to bounce it to run with the ball. No time-clock limit, ice hockey power plays and suicidal goalkeepers like Gaelic football. Very physical and fast-paced game. Score was something like 32-25. I felt like Kevin Spacey in American Beauty at times. The handball game had a troupe of cheerleaders, all aged about 16 I’d guess. I didn’t know where to look. But don’t worry, I collected myself and leered. That said, I doubt I’ll go back unless they get to the final maybe. Wasn’t my cuppa green tea. Economist article on populism in the US. A WEEK or so ago America was seized by a spasm of fury over the bonuses paid to executives at AIG, a troubled insurance company. Across the country Americans were enraged that people who had helped to cause the financial meltdown were being rewarded for their incompetence. And Washington responded in kind. Congressmen queued up before the television cameras to tell everybody how upset they were. Larry Summers, the president’s chief economic adviser, described the bonuses as “outrageous”. Even Barack Obama tried to drop his ultra-cool persona to say how “angry” he was. The House voted overwhelmingly to impose a 90% tax on such bonuses. The media responded to the storm of outrage by producing a stream of articles on American populism—the political disposition that damns established institutions, from Wall Street to Washington, and tries to return power to “the people”. Newsweek devoted almost an entire issue to the subject. But no sooner was the ink dry on these articles than the populist storm seemed to blow itself out. Many of the journalists who had been fanning the flames of anger attended a white-tie Gridiron Dinner in Washington on March 21st to perform silly song-and-dance routines. Wall Street rallied two days later when the treasury secretary, Tim Geithner, published his plan to tackle toxic assets held by banks. Steny Hoyer, the House majority leader, suggests that bonus legislation “may not be necessary” now that 15 of the top 20 “bonus babies” at AIG have agreed to give their bonuses back. Was the fuss over AIG a sign of a new populist mood in America? Or was it just a storm in a teacup? It is hard to answer this question in a country in which anger is a form of entertainment and where the political parties have turned partisanship into a fine art. Television personalities such as Bill O’Reilly are always angry about something or other. Many of the politicians who proclaimed their outrage at the “malefactors of great wealth” are delighted to take campaign contributions from the very same malefactors. But, for all that, there are good reasons for taking the resurgence of populism seriously. One is the breadth of the discontent in the country. Left-wingers complain that Mr Obama is selling out his supporters in order to rescue irresponsible financial institutions. Right-wingers worry that he is using taxpayers’ money to save people from the consequences of their own profligacy. This fear has plenty of resonance outside the world of political enthusiasts: a recent Harris poll shows that 85% of Americans believe that big companies have too much influence on politicians and policymakers. Another factor is the size of the slump. America has lost almost 2m jobs in the past three months. The number of job openings is down 31% from a year ago. Consumer confidence is falling on all fronts. Mortgage delinquencies are at a record high. The future of attempts to stimulate the global economy is also in jeopardy: European leaders have implied that they will oppose pressure from Americans and Chinese to produce their own stimulus programme at the forthcoming G20 meeting. America may be witnessing the return of an old-fashioned version of populism, driven by economic anxiety and directed at economic interests. The people who gave the name to “populism” in the late 19th and early 20th centuries were worried about a prolonged agricultural depression and furious at the vested interests in Wall Street and Washington who, they thought, were responsible for that depression. Populists accused the elites of turning America into a land of “tramps and millionaires”. This brand of populism went underground during the boom years, but Franklin Roosevelt revived it during the Depression. In one of his most passionate speeches, in 1936, he attacked the “economic royalists” of big business and the Republican Party. In the 1960s economic populism was trumped by cultural populism. The Republican Party championed the interests of the “silent majority” against bra-burning feminists, civil-rights activists and effete liberals who were more interested in protecting the rights of criminals than preserving law and order. The Democrats made desultory attempts to revive economic populism in 2000 and in 2004: Al Gore campaigned for “the people against the powerful” and John Kerry denounced outsourcing companies. But this proved to be no match for the Republicans’ cultural populism. Now economic populism is returning to the heart of American politics. This economic populism is made particularly potent by the long-term decline of faith in American institutions. The General Social Survey has been polling Americans about their confidence in major institutions (among other things) since 1972. The preliminary data for 2008 show a marked drop in confidence in every American institution since 2000 except military ones and education. The proportion of people expressing “a great deal of confidence” fell from 30% in 2000 to 16% in 2008 for big business, from 30% to 19% for banks, from 29% to 20% for organised religion, from 14% to 11% for the executive branch and from 13% to 11% for Congress. It was up, to 52%, for the armed services. These figures are the stuff that nasty movements are made of. Populism poses serious problems for both political parties, not least because the very institutions which they spend their lives squabbling over are some of the least respected in the country, just above television and the press. The danger for Mr Obama and the ruling Democrats is that the administration is relying heavily on private investors and Wall Street banks to implement its various rescue plans. This inevitably means rewarding some of the people who were responsible for the crisis. The president hopes that his budget will channel destructive anger into support for his policies. But he could also find his administration blown off-course or even swept aside by popular outrage. Great video and tune. A tribute to my great mate Os. May it not be too long pal!